Hi Loves! Welcome to A Sampling Bee. Today, I share with you Kidstir. 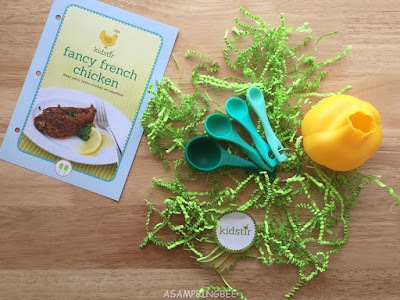 Kidstir is a monthly kid's subscription box that allows your kids to help you cook! We want to raise our children so that they have a healthy and happy connection to food. These monthly hands-on kits allow kids to build their own cookbooks, try new foods and learn about where food comes from. When you start your subscription with Kidstir, they send you a 3 ring binder to keep all of your recipes in. I love this idea because the recipe book is something that they can share one day with their children. 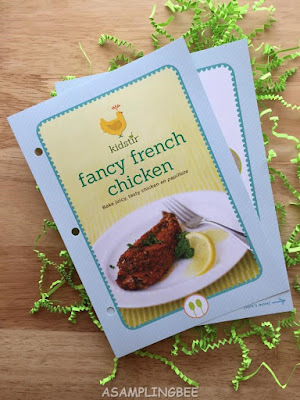 This recipe card is for Fancy French Chicken. My 3 year old son loves helping me in the kitchen. He had a lot of fun seasoning the chicken. He also loved using the Magic Garlic Bulb! Here is my son's hard work! He was so proud of his dinner :) This Fancy French Chicken recipe was amazing! This is the best subscription box to get your kids into the kitchen. Creating a love for healthy food early on is so important. Letting my son help me in the kitchen and allowing him to get his hands dirty will make him want to prepare a healthy meal. Kidstir is fun, creative and unique. I look forward to experiencing other Kidstir boxes with my boys. I really loved the idea of the Table Talk cards. These cards allowed us to have a nice conversation while we enjoyed our delicious chicken. The tools that the box came with made me want to create a kid's kitchen tool drawer. A place where they can keep all of their cooking utensils. Using fun tools in the kitchen will make your kids want to help :) I also loved the tip card that showed my son the proper way to set a table. The recipes that this box came with were delicious. 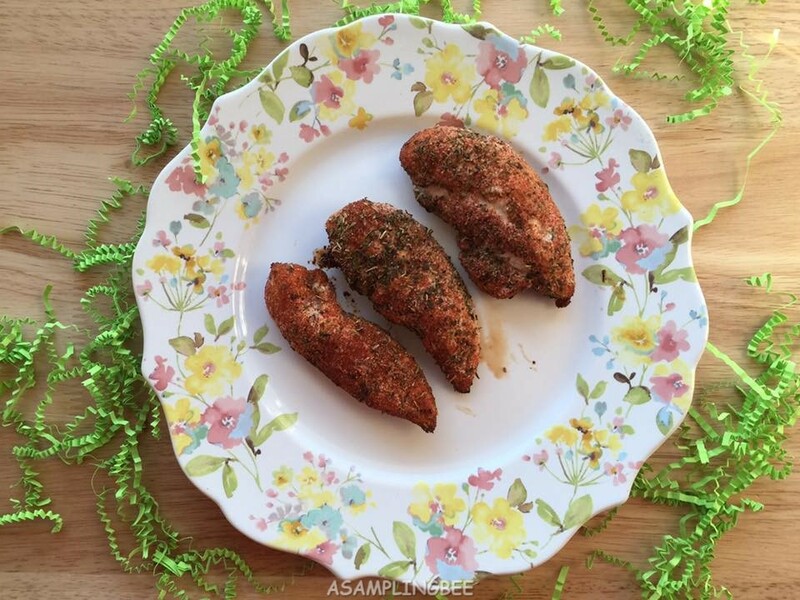 They were super easy to make and only required a few ingredients. Most of which I had in the house already. All-in-all, I really enjoyed everything about this subscription box. We had a great time cooking, setting the table and talking. I highly recommend Kidstir! 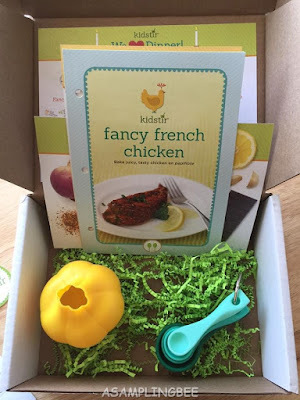 I received a Kidstir box in exchange for my honest review. All opinions are my own. Thanks, Kidstir! My oldest LOVES to cook. This would be perfect for him. I love this. What an amazing little box! I've never heard of it before, but I'm really intrigued now! Kids NEED this kind of fun! This is such a great idea! I need to try this for my son. 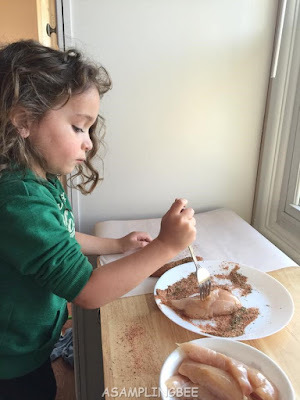 I think cooking together is such a great way to bond and teach basic lessons. I like that the things in this subscription box bring the family closer together. The chicken looks great! I love it when the kids help me in the kitchen. It's always messy but it's more fun with them in there. You can just see the smiles and the excitement! I love it. Thanks for sharing your experience with this subscription box. This is an awesome subscription box option. My little girls would have a ball with it. I love this. My 5 yr old loves to cook with me, and this would give her such a great time making food. What an amazing little chef! This looks so good! I love this idea! My nieces love to cook with me. I think they would really enjoy this each month. This seems like a great idea for food education. I'm all about teaching people how to cook, and getting the little ones in the kitchen and teaching them is great!